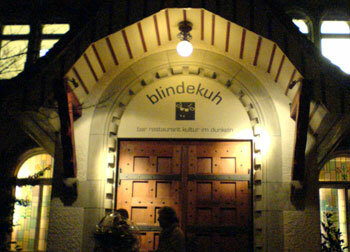 Ever since I heard of an unusual restaurant in Zürich that purported to give diners a small taste of what it would be like to be blind, I was intrigued. As a sighted person and foodie, the appearance of food is just as important as the taste and smell. Japanese cuisine in particular really puts a strong emphasis on the appearance of food. Besides, I'm a very visual person anyway - I design web sites and interfaces for a living. What if my sight was taken away? Would I enjoy food in the same way, or would something be lost? 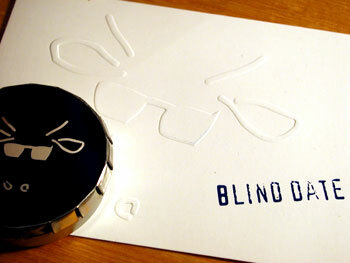 Last night, I finally got the opportunity to go to this unusual place, the Restaurant Blinde Kuh. (The name means Blind Cow and is a reference to the game "Blinde Kuh" which is the German term for what's known in English as Blindman's Bluff. It also refers to a common Swiss saying dunkel wie in eine Kuh - "as dark as the inside of a cow".) It was a belated birthday present, and the evening included a three course dinner and musical entertainment. It was such an extraordinary experience that I've been thinking it over all day. The restaurant itself is housed in a converted church, in a residential part of the city. All the guests including ourselves couldn't enter the restaurant until about 15 minutes before the 6:30 reservation time. At 6:15pm, the the steel clad and studded wooden doors were opened by a couple of very chirpy ladies, and we were ushered into the typically Swiss modern and brightly lit lobby. Right away, the staff asked all the guests to deposit their belongings, especially mobile phones, into the provided lockers. Anything that made light or noise should be left in the lockers, they informed us. We picked a locker and dutifully stored away our bags, gave our names to the receptionist, and studied the pre-set menu on that was projected onto one wall, and waited. At 6:30 sharp, another very cheerful lady who introduced herself as Karin (she was to be our waitress) emerged from the dark portal to the far left of the lobby and called out eight names, ours amongst them. We were to be the first to enter the restaurant that evening. She instructed us to line up in a conga row, with herself at the head and our hands on the shoulders of the person in front. This way, she told us, she could lead us safely into the restaurant proper. My heart was beating a little faster - this was exciting, sort of like going onto a rollercoaster in the dark. Our group was already giggling rather nervously. One by one we were lead to our chairs and seated by Karin. As I was the last to be seated I could guide myself by grabbing the edge of the table. All the tables and chairs had rounded corners - probably a necessity. Once seated, I tentatively groped the table in front of me, locating forks, knives, napkin and a glass. When we were served our drinks, we were informed that the bottle would always be placed behind the glass. As the restaurant gradually filled up, I realized that already I was more aware of sounds and smells than usual. Someone at a nearby table was wearing a sort of flowery perfume: it wasn't really strong at all, but I was aware of the scent for the whole evening. Sounds, too - the chink of silverware, the clinking of glasses, and the hum of conversation - all of it seemed more prominent. Something about being in total darkness seemed to loosen up people too: a restaurant in Zürich usually isn't that boisterous, but it sure was in there - people were laughing loudly, and occasionally shouting! Another thing I realized is how much I usually rely on non-verbal communication, such as raising a hand to call a waiter, or smiling and nodding to say something was good. Part of this is because when I first came to Switzerland, I didn't understand or speak any Swiss-German and I got into the habit of various degrees of miming to get my point across. I still do this to a degree, both here and when I travel. But in total darkness of course this doesn't work! It was astonishing how gracefully the waitresses moved about in the darkness, barely ever bumping into anything. It seems that many of them are blind, and according to the restaurant's web site one of the chefs has very limited vision. The fun really started when the appetizer came, a salad. It was very hard to actually locate and pick up the food with a fork. I kept scooping and missing, and from the sounds of it there was at least a couple of plate turnovers. I did manage to get most of the wet, creamy stuff which turned out to be a sort of herb-flavored cottage cheese, but the salad leaves kept evading me. I finally gave up and picked up most of it with my fingers. I certainly wasn't alone in this from what everyone else was saying though. After the appetizer course, the evening's entertainment commenced - a concert by an a cappella group called Voxtasy. I thought that an a cappella concert for a totally dark restaurant was a stroke of genius - you really get to appreciate the harmonies. The one problem I had that I didn't anticipate, was that since it was absolutely dark, it was the same as if I had my eyes closed - and, when I close my eyes while sitting in a warm, cosy place, I tend to fall asleep! So although Voxtasy was very good, I think I nodded off through a lot of their songs, unfortunately. After an hour or so (it was hard to tell of course with no visible watches) the concert wrapped up, and we went on to the main course. If anything, this was even more difficult than the salad because it was hot, and sauced. I felt around and discovered a piece of meat, which I cut as carefully as I could so it didn't go flying off the plate. I poked around a bit with my fingertips and found some round things, and what felt like a fuzzy flower - that one turned out to be broccoli. The round things were either gnocchi or spaetzle (noodle dumplings), and the meat was a veal filet. Everything tasted good and was very familiar - veal, creamy mushroom sauce, the gnocchi or spaetzle, and some steamed vegetables. I would imagine that the restaurant can't really serve anything too unfamiliar to Swiss people, or they'd be afraid of what they were eating! I managed to get most of the meat by knife and fork, but picked up a lot of gnocchi/spaetzle pieces with my hands. The dessert was also something familiar - some creamy custard thing inside a choux pastry. By that stage I more or less gave up on keeping my hands clean, and grabbed the choux part with my hand and scooped up the custard part as well as I could with a spoon. One of my dining partners said he was licking the plate - we couldn't see him so he could have been! Another chimed in by saying he was scratching himself. By this time we were getting quite silly. At the end of the meal, Karin our waitress thoughtfully brought us some lemon scented towels to wipe our hands off on. They must be used to guests with very grubby hands. At last it was time to go. We again formed a conga line behind Karin, and shuffled our way out. Once we reached the dimly lit intermediate vestibule area, she told us to stop for a bit so that our eyes could get used to light again. This was very necessary - I felt quite dizzy for a few seconds. Finally, we stepped out to the bright lobby, and back to the land of the sighted. What this experience taught me was how precious the ability to see is. I have very bad eyesight, but even without glasses or contact lenses I can at least see light and shapes. Total blindness is something entirely different, and the Blinde Kuh gives us a chance to experience for just one evening how it feels to have no sight. It's not a place to go for gastronomic reasons, though the food is fine. If you want a very unusual dining experience though, definitely consider it whenever you are in Zürich. They also have a restaurant in Basel. A word of caution: since you will be dependent on what is said to you, be sure to tell them that you don't understand German well (if you don't) when you make the reservation, or bring someone who can translate for you. And be sure not to take more than one crostini. Submitted by maki on 2006-02-03 19:36. Hmm, it could be an interesting idea for a dinner party! I've heard it takes a really long time to get a reservation at the Blinde Kuh. Did you have to wait a long time? Elizabeth, it didn't take that long...we just called up and that was that. The website says during what times to call..8:45 to 10:45, and from 14:00 to 16:00. We did call some weeks in advance though, after seeing the a cappella concert listed on their web site. For regular nights without any events they say you can also use their reservations form on the web site. Fascinating experience. Thanks for the insightful report. I could imagine that the flavor of the food was more intense than "normal". I'm so excited you wrote your visit to Blinde Kuh up! I had only HEARD of this restaurant and only in brief passing. How wonderful it was to read about it in detail! But--I wonder if I should wear a plastic poncho to dinner. I think I would spill or drip a few things on myself. Max, the flavors were indeed rather intensified. I sort of wish they had actually served something a bit stronger flavored - a dark chocolate mousse or something would have been exciting. This really sounds like a cool restaurant. It must have been wierd listening to music in the dark. I am not sure how I would enjoy it, but it sounds like something to do when in Zurich. And when Max takes you out to eat, you have to go someplace special. I'm studying architecture at Uni. We have been set a community housing project. I have chosen a live/work scheme for 11 people with sight loss. I think the restaurant idea is interesting, as I have read waiters in these restaurants are visually impaired. I have never been to one myself and was hoping someone could fill me on things like.. what they are like to eat in? Are they really pitch black or is there dim lighting over your plate? What happens when you need the loo? And also did you thing that it worked? Any information on how it works would be very much appreciated. Thank you. It was very strange to eat in. I was there almost 2 years ago and it's still fresh in my mind. Yes it was totally pitch dark, no light whatsoever. I couldn't even see my hand if I held it right in front of my face. If the objective is to experience how it feels to be blind, it sure did work. Thanks for the wonderful information of experiencing Blinde Kuh,....i wanted to know about this restaurent ever since i read about it in one of my German Language textbook,....looking forward to visiting it in my next trip.